What a gem of a film this is – and so colourful. Showing my age a little now, I remember in the early days of British Colour Television I was out with friends at a local pub and showing on this NEW Colour TV was this film ‘Lili’ and that memory still remains with me to this day purely because of the bright colour – actually on a TV screen !!! That seemed miraculous after all the TV years in Black and White – although I have to say television was very good in those days too. This film though was perfect to show off colour – and still is I think. The film was released in 1953. An absolutely perfect little film, “Lili” is probably Mel Ferrer’s best known movie role. He plays ex-dancer and crippled puppeteer Paul Bertholet opposite Leslie Caron in one of her most famous roles as the titled heroine. A musical fantasy based on a short story by Paul Gallico, Lili is a 16-year-old orphan left unexpectedly alone in a harsh world. She attaches herself to a glamorous magician called Marcus the Magnificent (played with just the right touch of shallow charm and careless concern by Jean-Pierre Aumont) and guilelessly follows him back to the carnival where he performs. When Marc’s half-hearted attempt to get her a job proves disastrous, the destitute Lili contemplates suicide, but the lame puppeteer Paul – who’s been watching from afar – uses one of his puppets to lure her back to safety and straight into his impenetrable heart. Paul hires Lili to be part of his act and the new show, which features Lili interacting with his four puppets, becomes an overwhelming success. 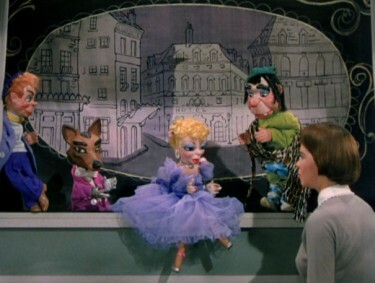 But Paul is too bitter and jealous to express his love for Lili except through the puppets, and after a particularly ugly argument with him, Lili decides to leave the show. Miles away from the carnival, she daydreams that her only true friends - the four puppets – are walking beside her. As she dances with each of them, they transform one by one into their puppeteer, and she understands at last that the puppets who love her are in fact Paul. Much of the charm of Lili rests with the casting of the film and Charles Walters’ crystal clear conception of the fantasy that borders on reality. Lili’s dreams are expressed in dance sequences, immaculately choreographed by Walters. Ex-ballerina Leslie Caron is still as much dancer as actress in 1953, and both her male co-stars have enough dance in their backgrounds to be effective. Mel Ferrer in particular brings elegance and musical style to the final ballet sequence. 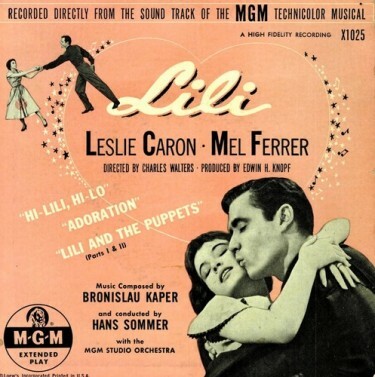 This film was a huge hit for MGM, adored equally by critics and the public, and receiving Academy Award nominations for Leslie Caron in the leading role, director Charles Walters, a nomination for the film itself and most significantly an Oscar win for the enormously popular song used throughout, “Hi Lili,” written by Bronislau Kaper. 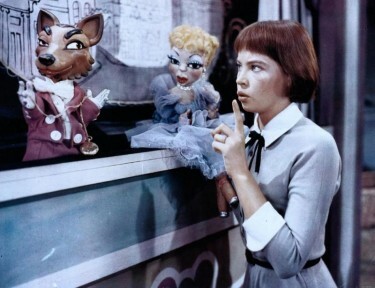 The song was sung in the film by Leslie Caron as Lili and Mel Ferrer as the puppet Carrottop, and residuals from sales of released recordings still accrue, indicating how much the music continues to be loved. Variations on the tune were used effectively for the final ballet sequence, as well. While many reviews indicate the film belongs to Leslie Caron, who is truly inspired as the sweetly innocent Lili, the success of the film owes as much to the ensemble cast. It’s difficult to imagine any of the roles with other actors. 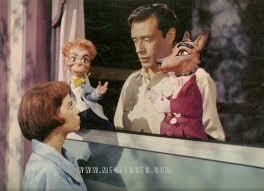 The final ballet owes much to Mel Ferrer’s dance background, but his radio experience and fluent language skills also helped him create the unique characters of the four puppets, all of whom were voiced by the actor. And the surly Paul with his tortured romantic soul suited him perfectly. After 50 years, it’s still the role for which Mel Ferrer is best known, a true tribute to his part in this flawless gem. Ironically – given the film’s enormous success – “Lili” was to become Mel Ferrer’s final starring role in a movie made in Hollywood. Although he co-starred in two more movies for MGM they were filmed overseas, and it was while shooting “Knights of the Round Table” in England that he met Audrey Hepburn. After their marriage in 1954 he lived and worked predominantly in Europe, never really capitalising on his biggest cinema triumph. “Lili” played a pivotal part in their romance, however. Apparently Miss Hepburn fell in love with Paul Bertholet before ever meeting Mel Ferrer and it prompted her to ask Gregory Peck to introduce her to him during the summer of 1953 while all three were in London. Less than a year later Mel Ferrer was seated next to Audrey Hepburn when her name was announced instead of Leslie Caron’s for the coveted Oscar. Leslie Caron (b. 1931) was the star of this film. She was 22 years old when it was made, playing a 16 year old girl. Her first film was An American in Paris (1951) with Gene Kelly (1912 – 1996) and is certainly the film she is most remembered for. Lili was her fifth film. Lili had in it many of those 1950s actors and actresses that nobody remembers. It also included Zsa Zsa Gabor (b. 1917) as a magician’s assistant, also in her fifth film but this was very much a bit part. 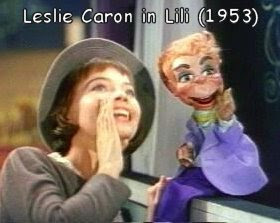 Leslie Caron – above – seen interacting with the puppets, who come alive for her and for the viewers.